If you are looking for a quality synthesizer then the Waldorf Blofeld is a 49-key Synthesizer with 25-voice Polyphony, Virtual Analog, Wavetable, and Sample-based Oscillators, 60MB Sample Memory, and has over 1,000 Sounds. It also has USB 2.0 so you can add samples easily. The interface is so easy to use and navigate. 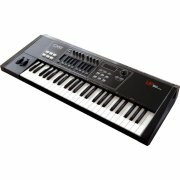 This is a serious synthesizer that will give you more options for your music production. It retails for around $1200. For more info visit Waldorf here.